General elections in India will take place in five phases over April and May, the Election Commission has said. Polling to elect a new Lok Sabha (lower house) will run from 16 April to 13 May. Counting is due on 16 May. Nearly four million officials will conduct the elections and 714 million voters are eligible to cast ballots. The incumbent Congress party-led coalition and parties led by the Hindu nationalist Bharatiya Janata Party will be battling a host of smaller parties. If no group wins a clear majority, the smaller regional parties could play a crucial role. Some states will hold votes in several phases. The new parliament has to be constituted by 2 June. The dates on which polling will be held are 16 April, 23 April, 30 April, 7 May and 13 May. "The election commission has taken into account the schedules of school examinations... holidays and festivals during the months of April and May and harvest season in certain parts of the country," Chief Election Commissioner N Gopalaswamy told a press conference in the Indian capital, Delhi. "The inputs taken from the India meteorological department in respect of the coming monsoon have also been taken into account." The election had been staggered to allow for the movement of election staff and security personnel, Mr Gopalaswamy said. Nearly four million civil officials and more than two million security personnel will be deployed for the elections, he said. In all 828,804 polling centres will be set up across the country - one in Gujarat's Gir lion sanctuary for just one voter. Elections in the states of Jammu and Kashmir and Uttar Pradesh will take place in five phases, Mr Gopalaswamy said. Uttar Pradesh is India's most populous state and geographically one of its largest. Elections in Jammu and Kashmir, where a separatist militancy has been going on for nearly two decades, will require massive security arrangements. A four-phased vote will take place in Bihar while elections will be held over three phases in Maharashtra and West Bengal, the election commission said. Andhra Pradesh, Assam, Jharkhand, Karnataka, Manipur, Punjab, Madhya Pradesh and Orissa will all vote in two phases. In eight states, voting will be held over two phases and in the remaining 15 states, the elections will be single-phased. The BBC's Chris Morris in Delhi says the big electoral battle will be between the Congress-led coalition which currently governs India, and the main opposition alliance led by the Bharatiya Janata Party (BJP). Our correspondent says there are also many regional parties whose influence is growing, and frantic negotiations have been taking place for months as different political factions manoeuvre for position. These include the Bahujan Samaj Party (BSP) of the low-caste Dalit Chief Minister of Uttar Pradesh Ms Mayawati and an alliance of Left parties, which will play a role if neither of the big two emerges as a clear winner. The BJP is led by Lal Krishna Advani while Congress says Prime Minister Manmohan Singh will run for a second term. The economy and security will be key issues. The global economic crisis has had serious repercussions for the Indian economy and growth has been hit in the past year. Job losses, rising inflation and increasing prices of essentials, including foodstuffs, will all be on voters' minds. 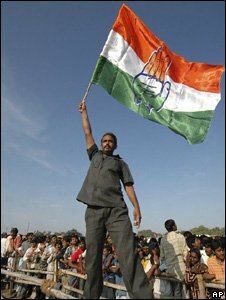 The BJP fought and lost the 2004 elections on the slogan of "India Shining", when large numbers of voters felt rapid economic growth had not been inclusive. Analysts say this time round Congress-led policies waiving farm loans and a rural employment guarantee scheme may attract more voters. The deteriorating security situation will also be a consideration with voters in a country which has seen a series of devastating bombings and attacks in recent years.